Knight of Gnisis is an epic Endurance creature card. It is part of the Houses of Morrowind expansion. "I serve the House with valor." 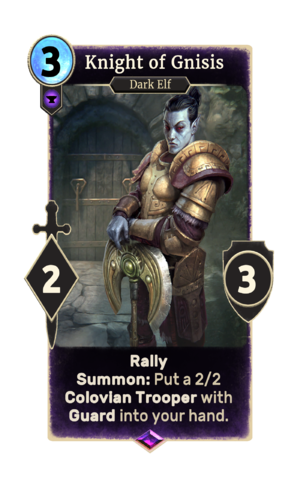 The card is named for Gnisis on Vvardenfell, which first appeared in Morrowind and was later destroyed in the Red Year. This page was last modified on 27 February 2019, at 23:55.